Hexavalent Chromium (Cr[VI]) Analysis Cartridge | OndaVia, Inc. 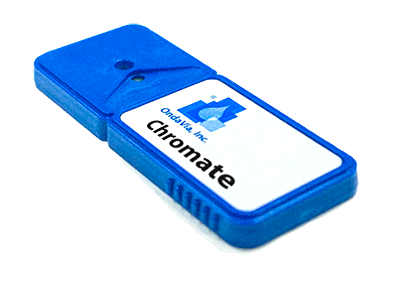 The OndaVia Analysis System with the Hexavalent Chromium Analysis Cartridge provides a fast, easy chromate measurement. The bench-top instrument consumes single-use, disposable analysis cartridges that provide a fast, easy-to-understand measurement of chromate levels in water. The method is specific to the Cr6+ ion, enabling differentiation from other chromium oxidation states. Whether used to measure treatment system performance or as part of a site survey, an OndaVia Analysis System provides fast, easy-to-understand chromate measurements. In contrast to the alternative of laboratory analysis, an OndaVia system gives you the on-site results needed for an immediate response. This product is packaged on demand. Please contact us for more information. Higher ranges available through dilution.